Original, custom designed home with spectacular views. This one owner, custom built home has 3 levels of living spaces with views in all directions. The exterior is brick on main level and new drivet exterior in 2016. Owner added veranda front covered terrace with gas fireplace, redwood topper, Tungsten heater and sound system in 2018. Interior has a modern, contemporary flair with maple floors & carpet in LR with gas FP and granite surround. Birch builtins. You can see into the dining room from front entryway. One wall is all glass, maple floors. Entry way(14x10) with maple floors and open stairway to second floor. Amazing first impression. Front door replaced. Butlers pantry(8x6) off DR. Kitchen features custom maple cabinets, gas FP, maple floors, double Thermodore ovens, gas cooktop, subzero frig/freezer, trash compactor, Bosch DW, Fischer Paykel dish drawer, Thermodore warming drawer, pantry(4x5), island. Eating area has builtins. Main floor laundry and 2 half baths(6x8 and 6x5). Back entry circle with bench and stained concrete(11x13). 4 car garage with infloor heat, 1170 sq.ft. Going upstairs is floating stairway system, maple and carpet. Electric windows around the stairway system. 5 bedrooms, 3 full baths, music room and office with custom bookcases, 2nd laundry area(8x9). Second floor circular room(11x13) with new carpet, entry to music room. Lower level features family room, W/O, game room, bedroom six with WIC and 3/4 bath(7x8) 2nd kitchen(7x9), sink, frig and DW stay, dark room(5x9),workshop(16x16) and circle room(11x13). 4 furnaces and 4 AC units 6 zones, 3 water heaters, one for infloor heat of garage, alarm system, 2 skylights, apple orchard, Rain bird sprinkler. Lots of trees. 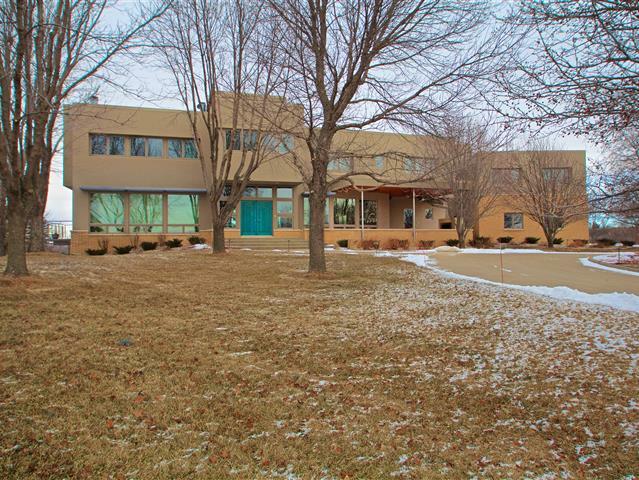 One of Sioux City's finest homes in superb condition. City water.